In 1936, Ishibashi-ya moved across the street and changed its name to 茶寮イシバシ Saryō Ishibashi which means something like “Tea Room Ishibashi.” The first floor was a 洋食喫茶 yōshoku kissa a café specializing in yōshoku, Japanized western dishes. The second floor was a banquet hall that served yōshoku for large events and parties. In 1945, the family running the shop was evacuated due to the destruction incurred by the American firebombing of Tōkyō. 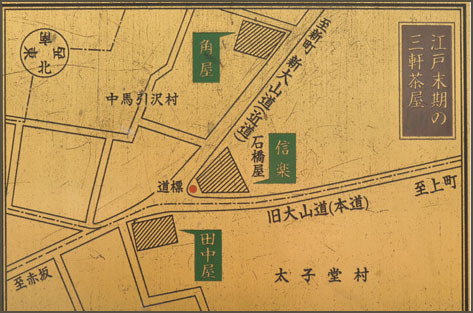 ... according to local legend Tanaka-ya re-emerged at some time in the Sangenjaya area. It didn’t come back as a teahouse but as a ceramics shop. The modern shop is called 田中屋陶苑 Tanakaya Tōen Tanaka Ceramics. The shop uses the family name and is the only surviving business with any connection to the Sangen-jaya place name. It seems that by the 1800’s, the popular name Sangen-jaya was already well known in the area. However, the name didn’t officially exist until quite recently. 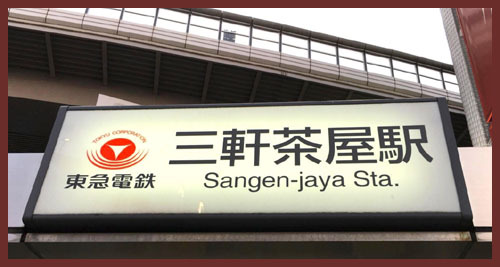 The birth of the official place name Sangen-jaya coincided with the 1932 creation of Setagaya Ward. 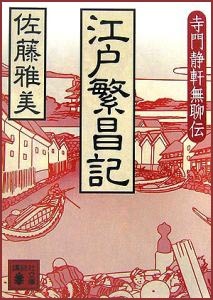 In the Meiji Period, the area became famous for シャボン屋 shabon-ya shops selling western soaps, 立飲屋 tachinomi-ya shops where you drink while standing, 駄菓子屋 dagashi-ya cheap candy and snack shops, and 魚屋 sakana-ya fish mongers. Today, it’s a rather affluent area with many bustling restaurants and bars. The literal translation of "ondo" is "sound head." Kanji, or the Chinese characters used in the Japanese language, often have literal and abstract meanings, here the kanji for "sound" (音-on) having a more abstract meaning of "melody" or "music," and the kanji for "head," (頭) having a more abstract meaning of "beat," "base pattern." 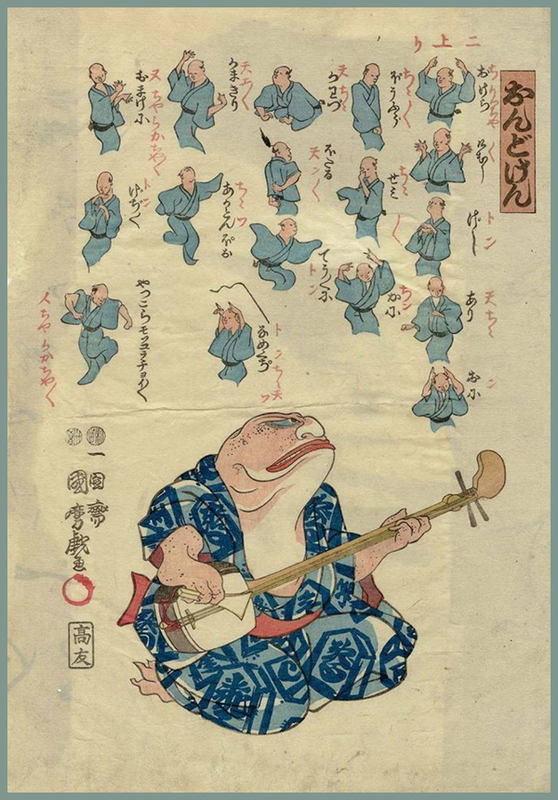 Hence "ondo" probably refers to a kind of "sound" or "beat pattern." There are other names used to describe older Japanese genres of music. For example, "fushi" or "bushi" (節), with its literal meaning of "node," "knuckle," or "joint," refers to the nodes found in bamboo, usually found at a steady sequence. Thus "fushi" can also have the abstract idea of "sequence" to refer to notes and beats in a sequence, i.e., a melody. usually refers to a kind of song with a distinct swung 2/2 rhythm. This "swing" can be referred to as "ukare" in Japanese. "Ondo" is a term used in older Japanese genres, but it is still used today when referring to songs written in this swinging style. Sometimes the rhythm is NOT swung and it is played straight through. This is called "kizami".
. Fujita Sooshi 藤田湘子 Fujita Soshi . of young Samurai . 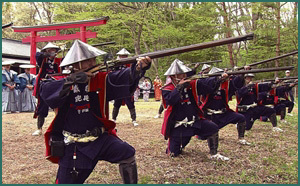 . .
aozamurai (aosamurai) is a young Samurai of lower rank. 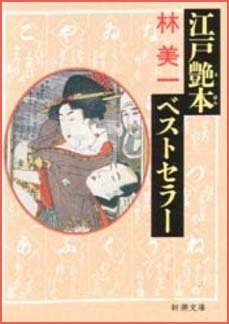 ... a fifth-rank Samurai who serves for a royal family or a court noble.
. Books, Printing and Publishing in Edo .
. Tōkaidōchū Hizakurige 東海道中膝栗毛 Shank's Mare . 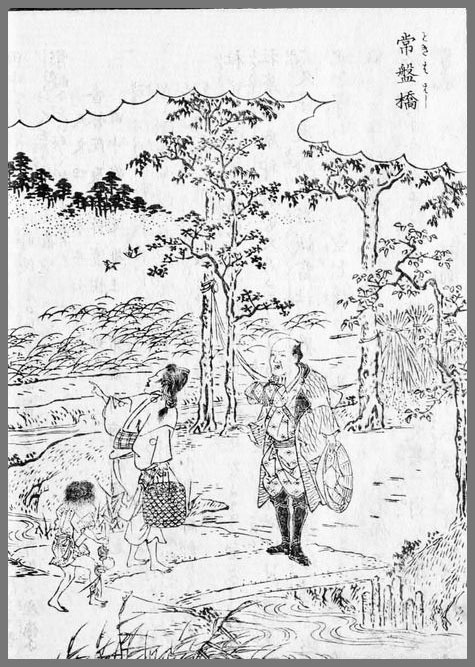 Yajirobē (彌次郎兵衛) and Kitahachi (喜多八) walking along the Tokaido road. 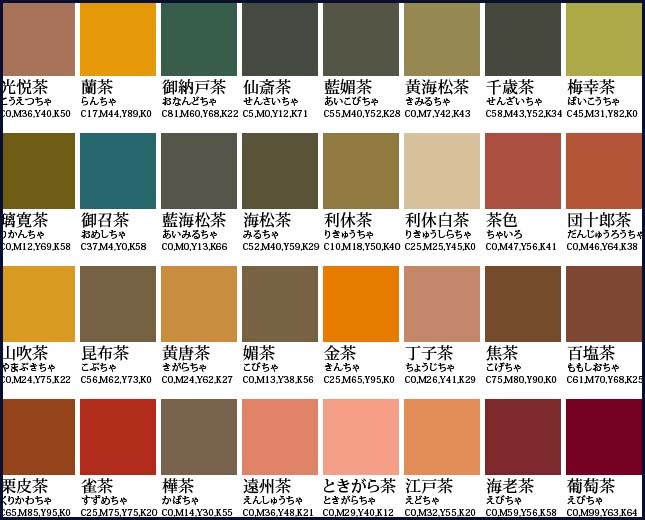 心学早染草 Shingaku Hayasomegusa / "Quick-dye Mind Study"
. Types of Dragons explained in the Satomi Hakkenden . 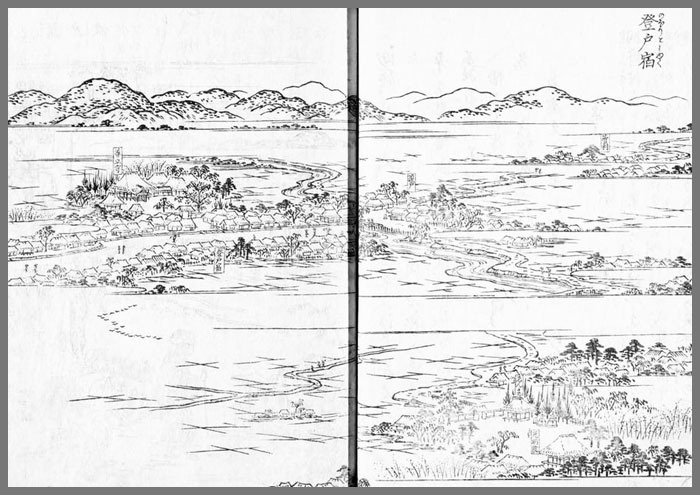 In 1803 the first Haikai Saijiki Shiorigusa (Kanzoo) 俳諧歳時記栞草 was compiled by Takizawa Bakin, with about 2600 seasonal themes and topics (kidai) and 3300 kigo.
. History of Saijiki . painter, calligrapher, and haiku poet. He wrote plays with supernatural themes and macabre and grotesque characters. In rural Japan, washing was often done at a river side. Some villages also had a special small waterway run through the main street and homes could use this water. Remote homes all had a special well or wakimizu 湧き水, fresh water welling out from the mountains and kept in a container, to be used for drinking, washing, bathing etc. 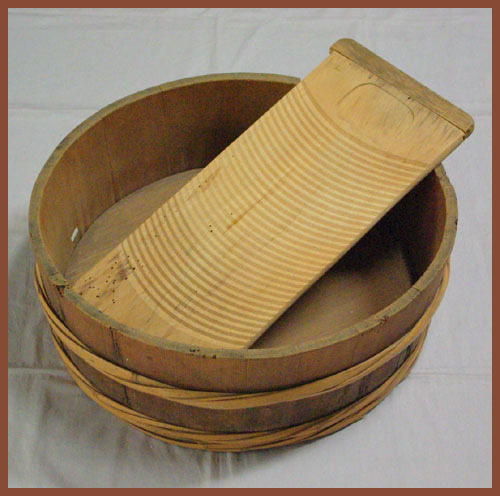 In towns, wells were the place to get water and cleaning the wells was important.
. sarashi-i . 晒井 cleaning the well . The goodwill of the God of Water is very important to a rice-growing and farming society.
. Suijin sama 水神様 The God of Water . Doing the laundry for a big family in the Edo period . . . without electricity, was hard work. sentakuita, sentaku-ita 洗濯板 a wooden board. Natural soap consisted of wood ash and fat or some alkali substance. This form of washing was used for Kimono and haori　羽織 jackets. In the past, a kimono would often be entirely taken apart for washing, and then re-sewn for wearing. This traditional washing method is called arai hari. Because the stitches must be taken out for washing, traditional kimono need to be hand sewn. 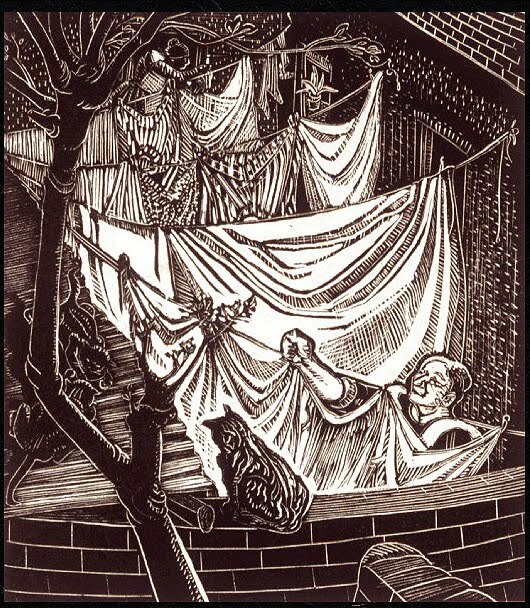 After washing, he fabric is stretched on a delicate frame of bamboo and strings or pasted on a wooden board. 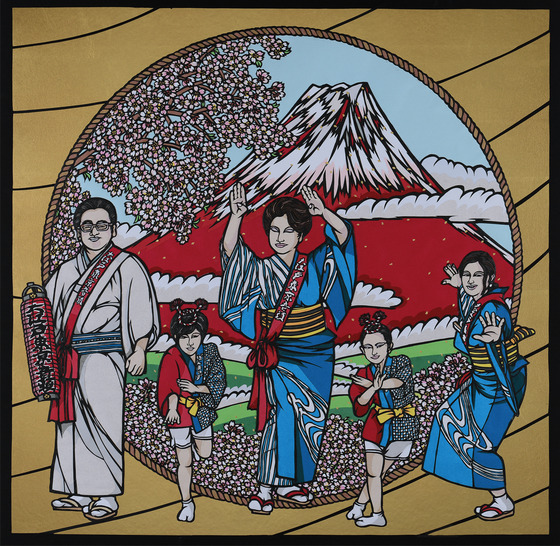 Arai hari is very expensive and difficult and is one of the causes of the declining popularity of kimono. Modern fabrics and cleaning methods have been developed that eliminate this need, although the traditional washing of kimono is still practiced, especially for high-end garments. The wooden plates were covered with nori 糊 natural glue and the pieces stretched on them. The plates were made of sugi 杉 one piece of cedar wood. The glue was funori 布海苔 made from sea weed (red algae, Gloiopeltis frucata.
. hari-ita uri 張り板売り vendors of wooden boards to dry a kimono after washing .
. kimono 着物 traditional Japanese robe .
. idobata kaigi　井戸端会議　debates (gossip) at the well .
. oni no inu ma ni sentaku 鬼の居ぬ間に洗濯 . Doing the laundry while the devil is away. 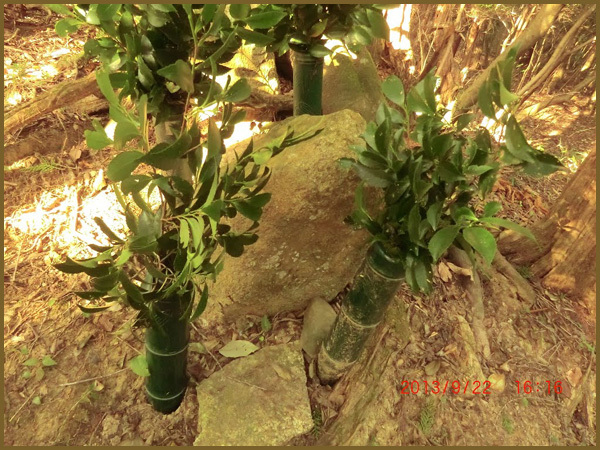 Near the river 平釜川 Hiragama thre was a temple with many trees in the compound. 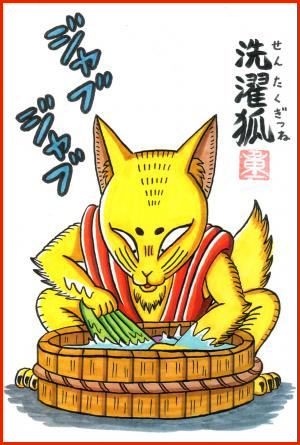 At night, a fox came to the river and people could hear the sound of ザブザブ zabu zabu as if he was doing the laundry.
. kitsune densetsu 狐　伝説 fox legends - Introduction .
. WKD : yanagi 柳 willow . 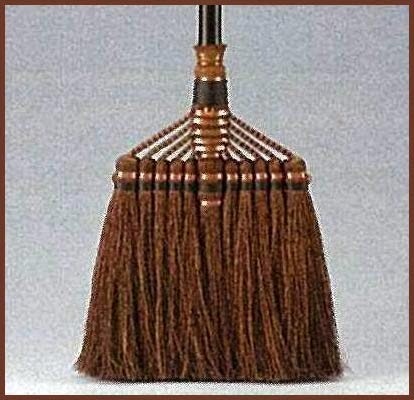 A broom is necessary to keep things clean, the home, the road . . .
. WKD : hatsubooki 初箒 first (use of the) broom . For a tawashi, the sheets of hemp palm are first dissipated into fibers and then bound together. For a broom they are first rounded up into bundles, fixed with bronze wires into a shape of five or seven bundles, and in the final process dissipated for about half of the length on a special maschine.
. tawashi たわし　/ 束子 scrubbing brush . 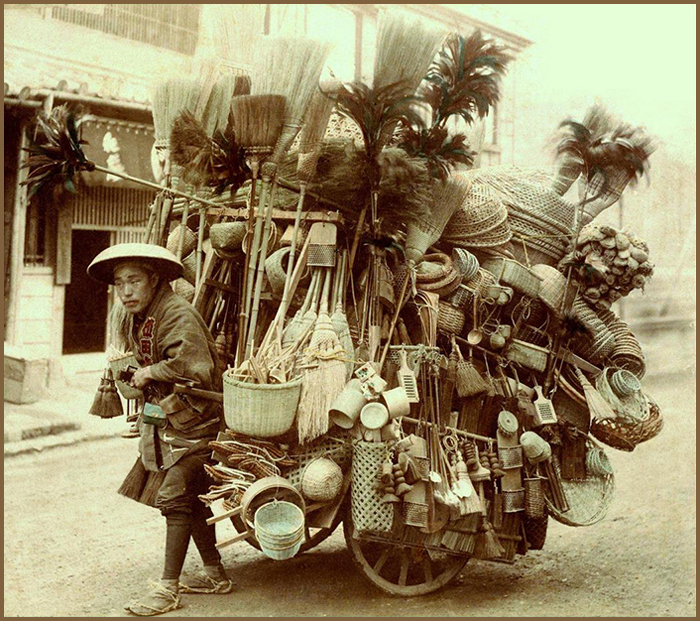 Brooms were first used for sweeping purposes in Heian period. 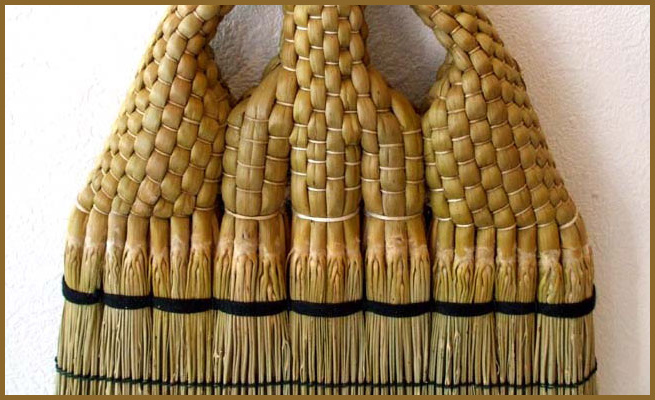 Bamboo, straw, or hemp were used to make brooms at the time. 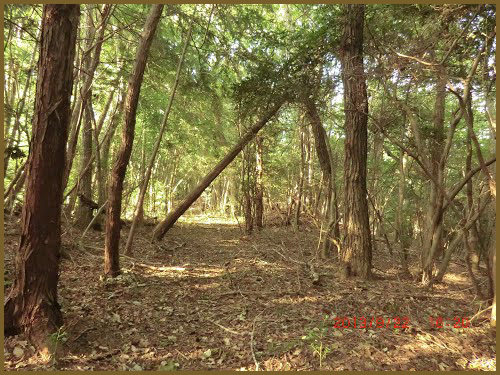 It was after the Edo era began when broom cypress began to be used for making brooms. Brooms in Japan were essentially used as a magical tool - for example, to stroke down a pregnant woman’s stomach with a broom today is still customary, after 400 years. Perhaps an aristocrat’s profound desire for peace was the beginning for this quiet and gentle tool. 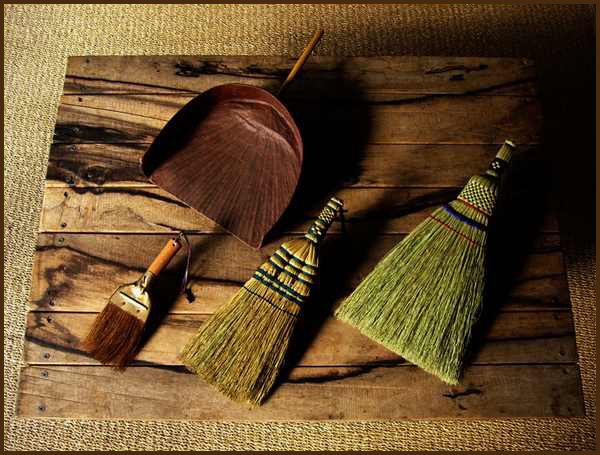 If you have never used an Edo style broom before, you might consider Edo brooms to be just an old thing. However, if you use it just once, you will know immediately how attractive a tool it can be for your life. There are a number of benefits of using Edo style brooms, such as they are soft and elastic so that one can sweep without laying unnecessary stress on it. Different from vacuum cleaners, you do not need to worry about the noise or any emissions. While it depends on how you deal with it, brooms using natural materials can last 5 to 10 years, and as you use them more, it can clean a wooden or tatami-mat floor more. The most important part of making an Edo broom is “Ho-yori,” which is selecting fine “ears.” The essential process starts here, and normally it takes 3 years for a craftsperson to become independent. Ears are sorted into 3 to 12 kinds by hardness, length, and color, but one-third of the ears will be thrown away at this stage. After sorting them out, he makes four or five small bundles, and he puts stems on them, without the tip of the ears going between the center part and the outside bundles, in order to keep a small space. 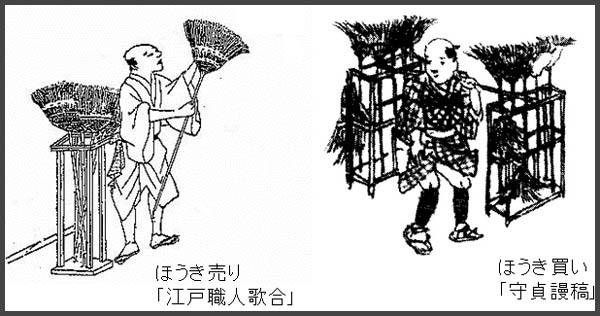 Then, he gives it elasticity, which is the main characteristic of Edo-style brooms. He attaches several tama-bundles in a row and tightens them together to the utmost with a wet hemp rope, adjusting their balance. After firmly fixing the joint of the bamboo handle to the body with an aluminum wire, he cuts the ear tips straight. Then, he presses the body under a Japanese cushion. This entire process is done manually without air-conditioner, so as to not dry out the ears. It definitely takes a long time to raise craftspeople with all of these techniques, so it has been a serious issue to find succesors. Apart from the Shuro palm, there were brooms of other materials.
. habooki 羽箒 "feather broom" .
. Takasago 高砂 a happy couple. and he carries a rake to rake in good fortune. In Japanese this is also a play of words with "One Hundred Years" (haku > sweeping the floor) and "until 99 years" (kujuku made > kumade, meaning a rake). Legends about the Broom Deity . 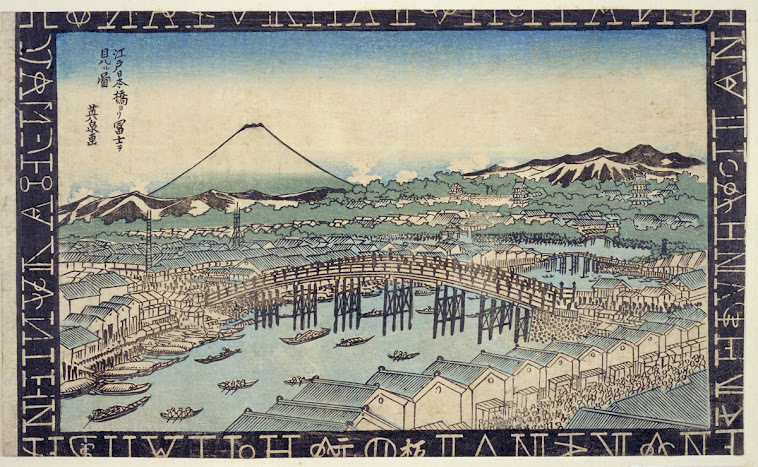 Craft guilds and craftspeople that specialized in repairing broken goods were not rare in the pre-industrial world, but Japan during the Edo Period was a uniquely closed-off island location where frugality was an important virtue and self-sufficiency was crucial to survival. During the long Edo period, quite a few laws to promote frugality were made. Food, robes and the general lifestyle were greatly influenced by this law. The common people were forbidden to wear silk robes 絹布着用禁. To pass aroung this law, the clever Edokko stopped using silk on the outside of their Kimono, but used them inside for linings. Special materials like yuuki tsumugi 結城紬 Yuki tsumugi used a cotton warp thread for weaving and were thus permitted. 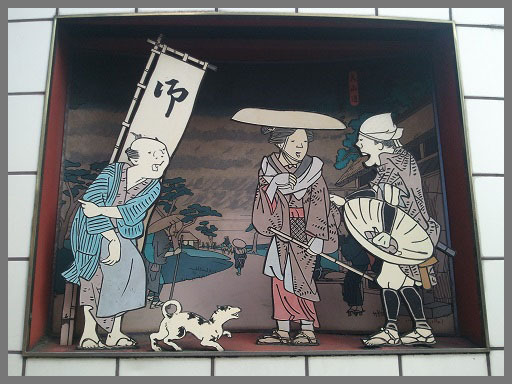 Yūki-tsumugi 結城紬 is the Japanese craft of silk cloth practised chiefly in the vicinity of Yūki in Ibaraki Prefecture. 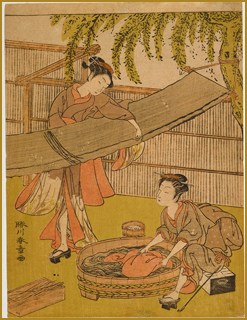 Developing from earlier silk techniques, the name Yūki-tsumugi was adopted in 1602. 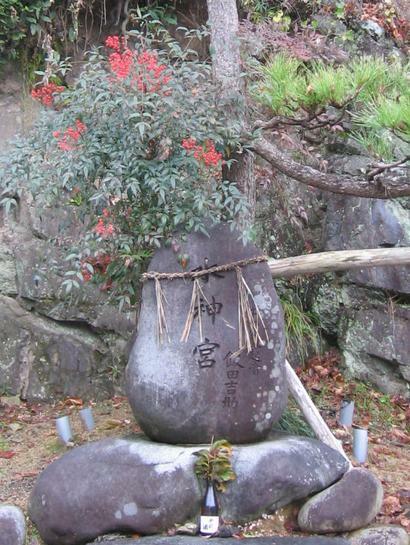 Weavers were invited from Ueda and the cloth, at first plain, was used as gifts for the shogun. Currently approximately one hundred and thirty craftsmen transmit the technique in Yūki and Oyama. Silk floss is extracted from silkworm cocoons and spun by hand into yarn. Patterns are added by tie-dyeing, before weaving with a loom known as a jibata (地機). The strap around the weaver's waist enables the tension of the vertical thread to be adjusted. It can take up to fifteen days to weave enough plain fabric for an adult garment, and up to forty-five days for patterned fabric. 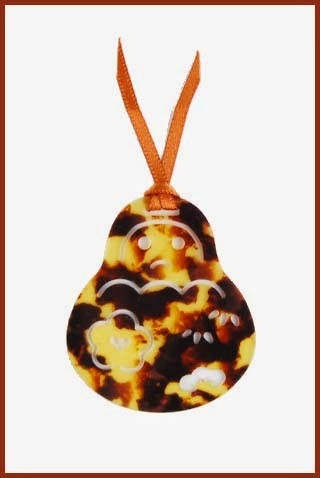 This is a modern Daruma from Celuloid, looking like bekko.
. bekkoo 鼈甲 / べっこう / べっ甲 tortoiseshell . 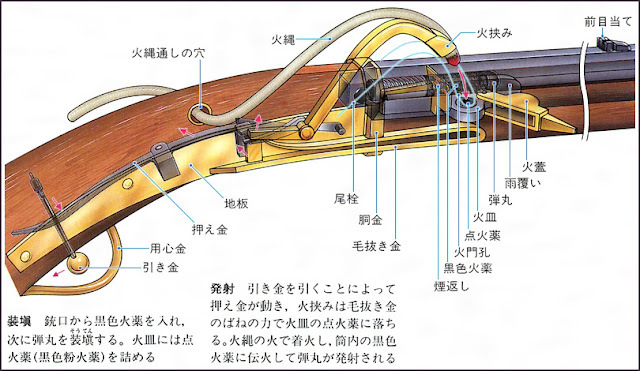 Some luxury was appearing within the regulations 規制内で贅沢. Since large 雛人形 Hina dolls for the Doll festival were forbidden, craftsmen made small but very luxurious ones. Yukuta robes from cotton were allowed, so the craftsmem made them with ever more elaborate patterns.
. hyaku nezumi 百鼠 a hundred shades of gray . so show their individual tastes. CLICK for more nezu colors ! FAQ: What were sumptuary edicts? 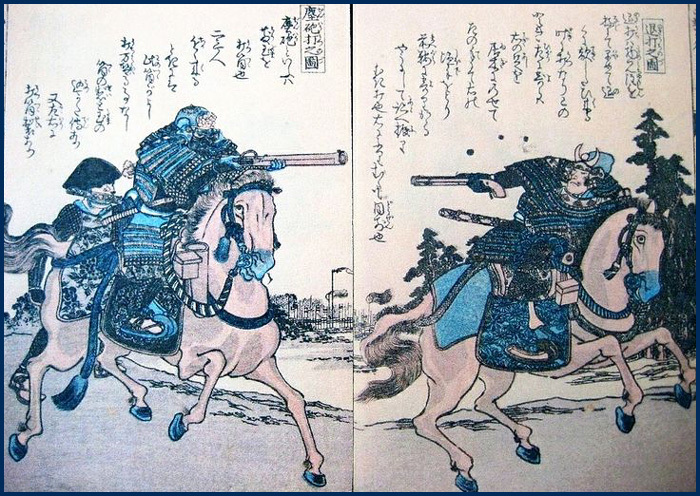 Numerous sumptuary regulations were issued throughout the Edo period (1615-1868) to control the expression of ideas that were deemed a threat to public decorum, safety, or morality, or that were subversive to the ruling Tokugawa shogunate. Ostentatious and inappropriate behavior and display for all the classes was proscribed. The earliest sumptuary laws were based on similar practices from China, where consumption was correlated positively with status. In Japan these regulations were called ken'yakurei ("laws regulating expenditures": 儉約令) for all classes of society. They did not constitute a distinct body of laws, but rather were part of the occasional regulatory proclamations (ofuregaki: 御觸書) issued by the rôjû ("council of elders": 牢中) and disseminated through various intermediaries to the intended group or class. Although the chônin ("persons of the town": 町人) often complained about the repressive measures, the government generally relied more on threats and exhortations than on imposing punishments. 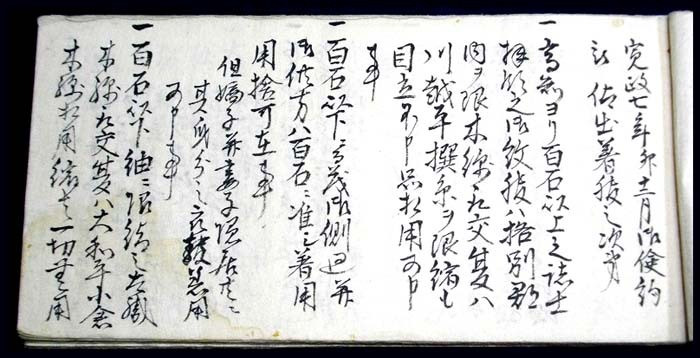 There were only a limited number of recorded cases of arrest for violating sumptuary edicts cited in Tokugawa-period legal documents or the popular literature. Throughout the Edo period the sumptuary regulations frequently referred to previous edicts, suggesting that many were not considered permanent or practically enforceable, and that compliance among the targeted groups was often a problem. 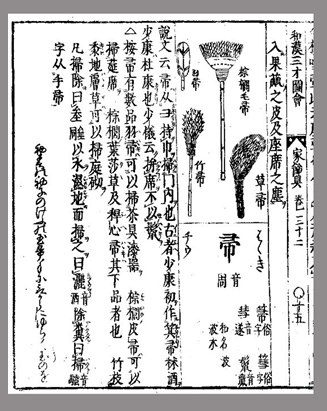 An expression of the time, mikka hatto ("three-day laws": 三日法度), suggested that violations of sumptuary laws often followed after only brief periods of compliance. 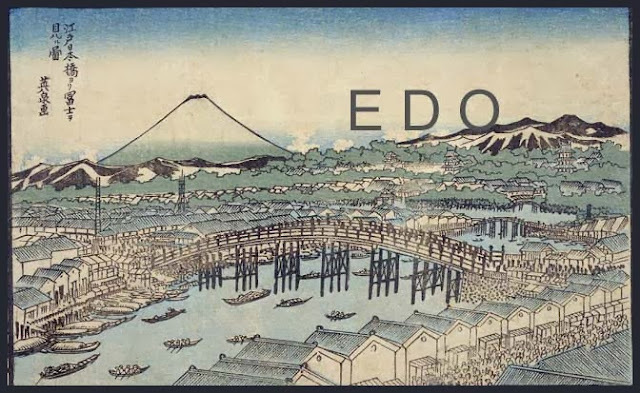 There were during the Edo period various periodic restrictions on "content," such as edicts that prohibited publishing about current events, unorthodox theories, rumors, scandals, erotica, government officials, or anything directly related to the Tokugawa rulers or the Imperial Family. One of the most repressive set of edicts was known as the Kansei Reforms, named after the era name Kansei (I/1789 - II/1801) in which they were enacted. With the death of the shogun Ieharu in 1786, his successor Ienari (1773-1841; ruled 1787-1837) remained a minor until 1793, and the real governing power was in the hands of Matsudaira Sadanobu (1758-1829), a grandson of the shogun Yoshimune and the daimyô (military lord, literally "great name") of the Shirakawa domain. Sadanobu held the post of chief councilor (rojû shuseki) from 1787 to 1793. He initiated reforms that he believed were needed after a series of riots in various cities in the summer of 1787 were precipitated by high rice prices following several years of poor harvests and famines. The early stages of the Kansei Reforms focused on the removal from power of corrupt officials and the institution of various specific measures to check inflation and stabilize prices. The reforms were later extended to the field of publishing in 1790. In the fifth month of that year, no new books were to be published except by special permission. Current events were not to be depicted in prints, and gorgeous and extravagant works were to be avoided. No unorthodox theories were to be published, while the publication of erotica was to be gradually halted. Other sumptuary edicts attempted to proscribe "appearance" and the expenditure of wealth as appropriate to each class. 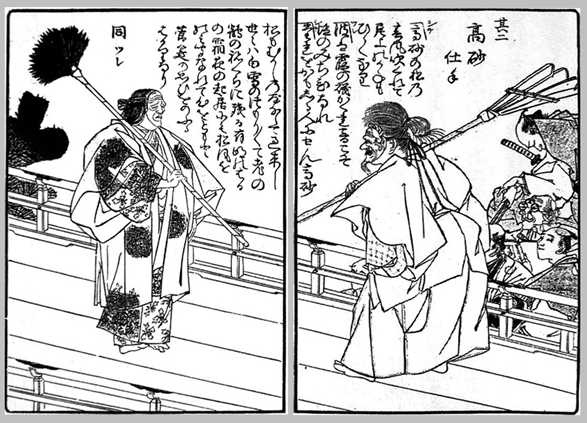 As some of the merchants began to amass large fortunes and live in a manner previously reserved only for the samurai class, the bakafu ("tent government," the shôgun's ruling officials) issued sumptuary laws to reinforce the distinctions between the classes, to encourage frugality, and to maintain a Neo-Confucian system of moral conduct. 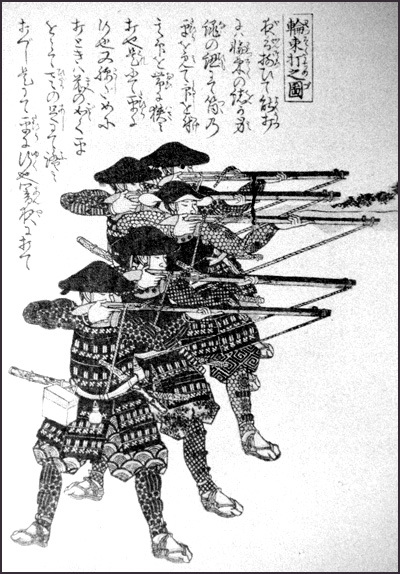 The government was particularly concerned that the morale and discipline of the samurai class should not be undermined by ostentatious displays of wealth among the 'chônin'. Many regulations proscribed the consumption of goods and services and placed limits on luxurious entertainment, identifying what was appropriate for members of each social level and closely correlating consumption with social status. 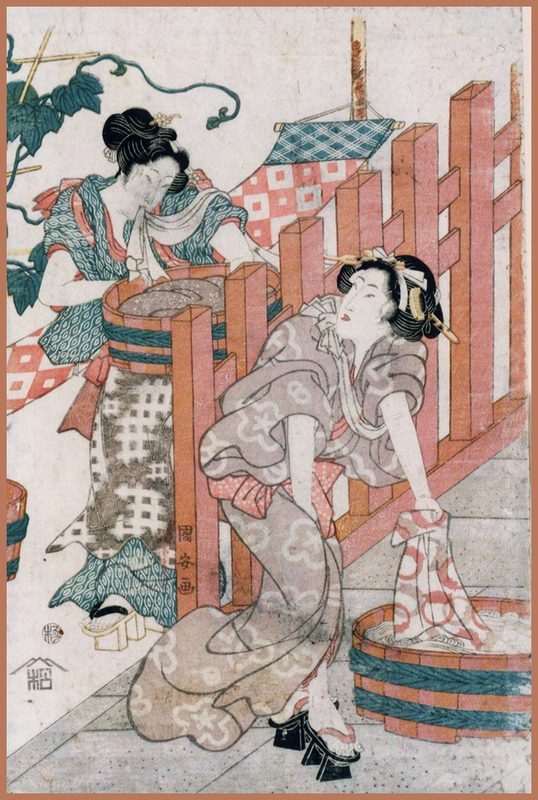 Ukiyo-e researchers have long cited examples of edicts that affected printmaking, such as the banning of prints with bust portraits of women in the first month of Kansei 12 (1800). The edict was a curious one, as it admitted that there was nothing really wrong with such prints, but that they were to be proscribed as medatsu ("conspicuous"). Another example was the ban in 1793 on prints with the names of women other than courtesans. Among the worst of the later set of edicts were the repressive Tenpô kaikaku ("Tenpô Reforms") of 1842-1847.